Mobilefun.co.uk have very kindly provided us with a STK 3 In 1 Data and Charging Cable with 8Pin Connector allowing charging of an iPad, iPhone 5, 5S, 4 and 4S alongside older iPad, iPhone and ipod models and a microUSB for most else. Charging a couple of phone should be okay, however dumping two tablets on there might not garner the most spectacular results. Designed to be the only cable that you will ever need – the STK 3 in 1 cable features Apple Lightning, Apple 30 pin and Micro USB connectors – designed to charge any device which uses any of these adapters. With more and more devices using Micro USB charging adapters, this cable is also designed to be future proof – so you won’t need to keep purchasing new cables to match your numerous devices. 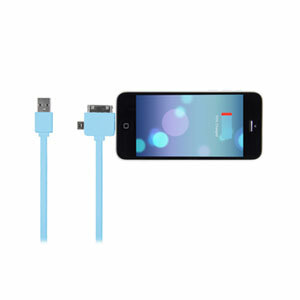 Quickly and easily sync / charge your mobile devices with the STK 3 in 1 Charge and Sync cable. Designed to give you complete freedom, the 3 in 1 cable allows you to manage all of your devices without having to carry around different cables with you all the time. This is the perfect solution for on-the-go lifestyles and multiple device owners. With this 3-in-1 Charge and Sync cable you can charge all of your devices at the same time, using just one USB cable. You can pick one up from mobilefun.co.uk.